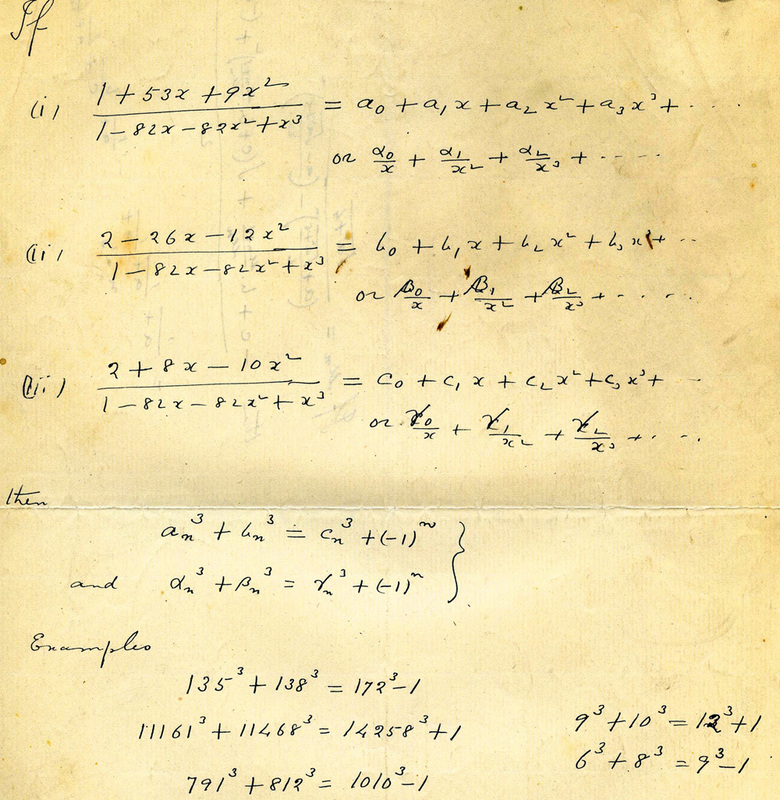 Ramanujan's manuscript. The representations of 1729 as the sum of two cubes appear in the bottom right corner. The equation expressing the near counter examples to Fermat's last theorem appears further up: α3 + β3 = γ3 + (-1)n. Image courtesy Trinity College library. Click here to see a larger image. A box of manuscripts and three notebooks. That's all that's left of the work of Srinivasa Ramanujan, an Indian mathematician who lived his remarkable but short life around the beginning of the twentieth century. Yet, that small stash of mathematical legacy still yields surprises. Two mathematicians of Emory University, Ken Ono and Sarah Trebat-Leder, have recently made a fascinating discovery within its yellowed pages. It shows that Ramanujan was further ahead of his time than anyone had expected, and provides a beautiful link between several milestones in the history of mathematics. And it all goes back to the innocuous-looking number 1729. Ramanujan's story is as inspiring as it is tragic. 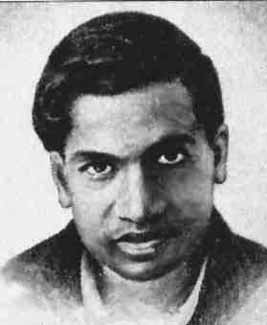 Born in 1887 in a small village around 400 km from Madras (now Chennai), Ramanujan developed a passion for mathematics at a young age, but had to pursue it mostly alone and in poverty. Until, in 1913, he decided to write a letter to the famous Cambridge number theorist G.H. Hardy. Accustomed to this early form of spam, Hardy might have been forgiven for dispatching the highly unorthodox letter straight to the bin. But he didn't. Recognising the author's genius, Hardy invited Ramanujan to Cambridge, where he arrived in 1914. Over the following years, Ramanujan more than repaid Hardy's faith in his talent, but suffered ill health due, in part, to the grizzly English climate and food. Ramanujan returned to India in 1919, still feeble, and died the following year, aged only 32. 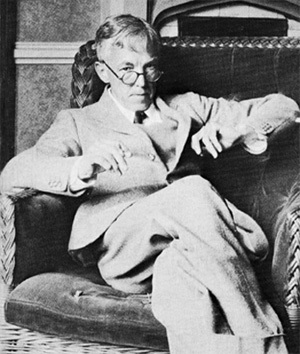 Hardy later described his collaboration with Ramanujan as "the one romantic incident in my life". The anecdote gained the number 1729 fame in mathematical circles, but until recently people believed its curious property was just another random fact Ramanujan carried about in his brain — much like a train spotter remembers train arrival times. What Ono and Trebat-Leder's discovery shows, however, is that it was just the tip of an ice berg. In reality Ramanujan had been busy developing a theory that was several decades ahead of its time and yields results that are interesting to mathematicians even today. He just didn't live long enough to publish it. The discovery came when Ono and fellow mathematician Andrew Granville were leafing through Ramanujan's manuscripts, kept at the Wren Library at Trinity College, Cambridge. "We were sitting right next to the librarian's desk, flipping page by page through the Ramanujan box," recalls Ono. "We came across this one page which had on it the two representations of 1729 [as the sum of cubes]. We started laughing immediately." Ono and Granville spotted the famous number even though it didn't itself appear on the page. Ramanujan had only written down the equation But what delighted the two mathematicians more than meeting the famous number in disguise was another equation appearing on the same page. It clearly showed that Ramanujan had been working on a problem that had become notorious way back in the 17th century and whose solution, in the 1990s, was a major mathematical sensation. It's known as Fermat's last theorem. Fermat scribbled in the margin of a page in a book that he had "discovered a truly marvellous proof of this, which this margin is too narrow to contain". Naturally, this assertion was like catnip to mathematicians, who subsequently drove themselves crazy, for over 350 years, trying to find this "truly marvellous proof". Since any positive whole number triple satisfying the equation would render Fermat’s assertion (that there are no such triples) false, Ramanujan had pinned down an infinite family of near-misses of what would be counter-examples to Fermat’s last theorem. "None of us had any idea that Ramanujan was thinking about anything [remotely] related to Fermat's last theorem," says Ono. "But here on a page, staring us in the face, were infinitely many near counter-examples to it, two of which happen to be related to 1729. We were floored." Even today, nearly 400 years after Fermat's claim and 20 years after its resolution, only a handful of mathematicians even know about the family Ramanujan had come up with. "I'm a Ramanujan scholar and I wasn't aware of it," says Ono. "Basically, nobody knew." Elliptic curves and climbing K3. But this isn't all. When Ono and his graduate student Sarah Trebat-Leder decided to investigate further, looking at other pages in Ramanujan's work, they found he had developed a sophisticated mathematical theory that went beyond anything people had suspected. "Sarah and I spent time thinking more deeply about what Ramanujan had really done, and it turns out that he anticipated [an area of] mathematic 30 or 40 years before anyone knew this field would exist. That's what we are excited about." where , and are constants. If you plot the points that satisfy such an equation (for given values of and ) in a coordinate system, you get a shape called an elliptic curve (the precise definition is slightly more involved, see here). Elliptic curves played an important role in the eventual proof of Fermat's last theorem, which was delivered in the 1990s by the mathematician Andrew Wiles. Ono and Trebat-Leder found that Ramanujan had also delved into the theory of elliptic curves. He did not anticipate the path taken by Wiles, but instead discovered an object that is more complicated than elliptic curves. When objects of this kind were rediscovered around forty years later they were adorned with the name of K3 surfaces — in honour of the mathematicians Ernst Kummer, Erich Kähler and Kunihiko Kodaira, and the mountain K2, which is as difficult to climb as K3 surfaces are difficult to handle mathematically. naturally cries out for solutions: pairs of numbers that satisfy the equation. In the spirit of Fermat, you might look for whole number solutions, but number theorists usually give themselves a little more leeway. They look for solutions that are rational numbers, that is, numbers that can be written as fractions. The elliptic curves corresponding to whole number values of a between -2 and 1 and whole number values of values of b between -1 and 2. Only the curve for a = b = 0 doesn't qualify as an elliptic curve because it has a sharp corner. 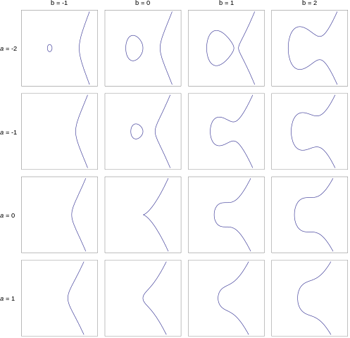 If you sift through all elliptic curves in a systematic way, for example by ordering them according to the size of the constants and that appear in their formulas, then you are most likely only ever going to come across these "simple" elliptic curves. The probability of finding a more complicated one, which requires two or three solutions to generate them all, is zero. Searching for such elliptic curves systematically is like searching a haystack for a needle in a way that guarantees the needle will always slip through the net. To get at those more complicated elliptic curves, you need another method. And this is exactly what Ramanujan came up with. His work on the K3 surface he discovered provided Ono and Trebat-Leder with a method to produce, not just one, but infinitely many elliptic curves requiring two or three solutions to generate all other solutions. It's not the first method that has been found, but it required no effort. "We tied the world record on the problem [of finding such elliptic curves], but we didn't have to do any heavy lifting," says Ono. "We did next to nothing, expcet recognise what Ramanujan did." There is another interesting twist to this story. While Ramanujan was working in the abstract realms of number theory, physicists studying real-world phenomena began developing the theory of quantum mechanics. Although a triumph in its own right, it soon became clear that the resulting quantum physics clashed with existing physical theories in an unredeemable way. The rift still hasn't been healed and presents the biggest problem of twenty-first century physics (see here to find out more). One attempt at rescuing the situation was the development, started in the 1960s, of string theory, a prime candidate for a "theory of everything" uniting the disparate strands of modern physics. G.H. Hardy (1877 - 1947). A curious prediction of string theory is that the world we live in consists of more than the three spatial dimensions we can see. The extra dimensions, the ones we can't see, are rolled up tightly in tiny little spaces too small for us to perceive. The theory dictates that those tiny little spaces have a particular geometric structure. There's a class of geometric objects, called Calabi-Yau manifolds, which fits the bill (see this article to find out more). And one of the simplest classes of Calabi-Yau manifolds comes from, wait for it, K3 surfaces, which Ramanujan was the first to discover. Ramanujan could never have dreamt of this development, of course. "He was a whiz with formulas and I think [his aim was] to construct those near counter-examples to Fermat's last theorem." says Ono. "So he developed a theory to find these near misses, without recognising that the machine he was building, those formulas that he was writing down, would be useful for anyone, ever, in the future." Ono doesn't rule out that Ramanujan's manuscripts contain further hidden treasures. "I've known about 1729 for thirty years. It's a lovely, romantic number. Ramanujan was a genius and we are still learning about the extent to which his creativity led him to his formulas. His work amounts to one box, kept at Trinity College, and three notebooks, kept at the University of Madras. That's not a lot. It's crazy that we are still figuring out what he had in mind. When is it going to end?" You can read more about the work of Ramanujan in A disappearing number. For experts, Ono and Trebat-Leder's paper is available here. Ken Ono is Asa Griggs Candler Professor of Mathematics and Computer Science at Emory University. Sarah Trebat-Leder is a PhD student at Emory, where she is a Woodruff Fellow and NSF Graduate Fellow. Marianne Freiberger is Editor of Plus. She interviewed Ono and Trebat-Leder in October 2015. There seems to be a mistake in the equation which has two a's and one b when it should have a,b and c as constants. It clearly states a, b and c are constants in the first line of tgat section. Which equation has the constant c in it? In "expect recognise what Ramanujan did", did you intend to type "except"? In 1995 Michael Hirschhorn was aware of these near misses. See his "An amazing identity of Ramanujan" and subsequent papers. Of course, the Hardy & Ramanujam story led to a series of pairs of cubes being combined in n ways (n=2 for 1729) being termed "Taxicab numbers". See a paper my father, the late Edwin Rosenstiel, which announed the discovery of the fourth in the series, published in The Institute of Mathematics and its Applications Bulletin July, 1991, Volume 27, pp 155-157. The other authors were John Dardis and myself (I did the computing on PCs of the era). My parents lived in Putney. The Hardy & Ramanujam story inspired the search that led to the paper. The smallest number that can be written as a sum of two cubes of integers in two (non-trivially) different ways is 91, not 1729. 91 = 3^3 + 4^3 = 6^3 + (-5)^3. I wonder if Ramanujan specified to Hardy that he was specifically referring to the natural numbers, because the folklore never seems to specify that. I think natural numbers are implied when talking about smallest. Otherwise one could give a trivial example that's 'smaller': -1729. Going by your logic , there would not be any 'smallest number' . Actually the numbers correspond to positive . This may have been pointed out elsewhere, but Ramanujan's statement was not that 1729 was the smallest number that satisfied the sum of two integer cubes; he maintained it was the smallest which could thus be described by two different pairs of integers. Therefore the 91 example does not apply. 172^3 = 135^3 + 138^3 + 1^3. We have a method for finding a cube which is the sum of three other cubes (one of these being equal to 1). this is (I think) a new result obtained "from the shoulders of a giant". You are not the only one! 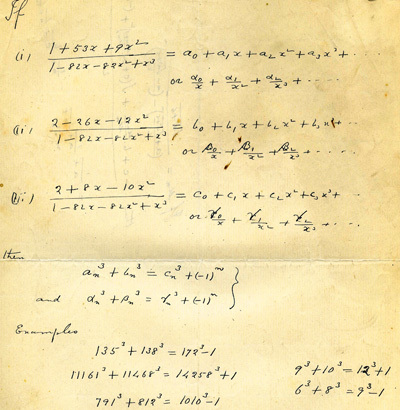 See my paper ``Ramanujan and Fermat's Last Theorem'' in the Australian Mathematical Gazette.